This is Phase One completed last year of your typicaly clear cut New Retirement Community that required community board approval for the design and new bed plantings. The arborvitae were requested by the homeowner and used as a privacy screen for the patio. To the left of the arborvitae is a young filbert or walking stick tree. I used a red lace leaf japanese maple as the focal point and main attraction on the left corner of the rear patio surrounding it with a variety of perrienals and stones. Nothing has been planted this year, and all that you see survived the blizzards of the 2010 winter. 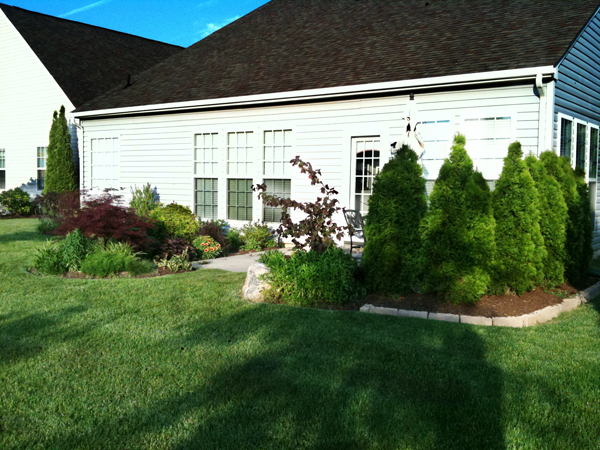 The planting beds were all given a rounded shape all across the back of the building leaving a five foot wide grass entrance to the back yard. Phase Two will consist of different beds and shaped mounds in the yard with tree and periennial plantings. The customer is very pleased with the results and is anxious to have Phase Two approved and installed this year.